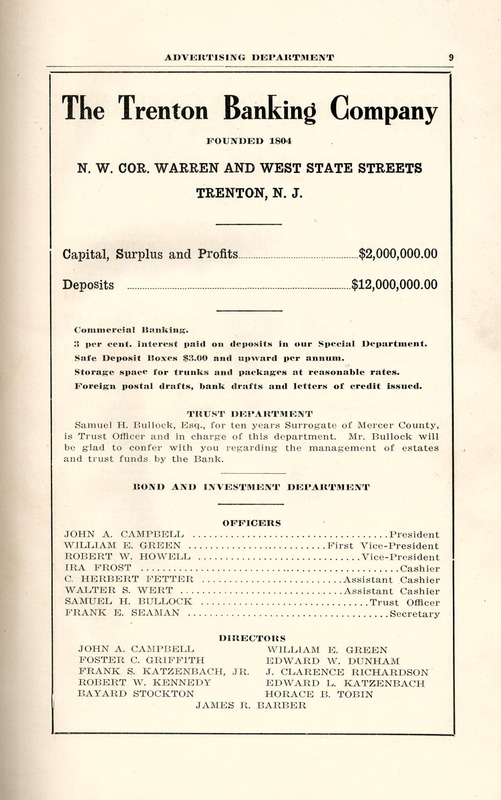 The Trenton Banking Company, N. W. Cor. Warren and West State Streets, Trenton, N. J.
Samuel H. Bullock, Esq., for ten years Surrogate of Mercer County, is Trust Officer and in charge of this department. Mr. Bullock will be glad to confer with you regarding the management of estates and trust funds by the Bank. JOHN A. CAMPBELL, FOSTER C. GRIFFITH, FRANK S. KATZENBACH, JR., ROBERT W. KENNEDY, BAYARD STOCKTON, WILLIAM E. GREEN, EDWARD W. DUNHAM, J. CLARENCE RICHARDSON, EDWARD L. KATZENBACH, HORACE B. TOBIN, JAMES R. BARBER.